A Subaru WRX STI was harmed in the making of The Grand Tour: Farmkhana. Jeremy Clarkson does his best Ken Block impersonation in the video below with some crashes along the way. Ken Block created the Gymkhana series and its come a long way since he first powered a 2006 Subaru WRX STI around an airfield back in 2008. He did it to promote some shoes. Jeremy Clarkson creates his own unique take on Ken Block’s Gymkhana series in what he calls “Farmkhana” using a second-generation Subaru WRX STI and “the suitable backdrop of English farmland.” Block is famous for his precision driving tricks in a Subaru WRX STI. Now Jeremy Clarkson takes his turn in another WR Blue 2006 Subaru WRX STI and tries to mimic Blocks driving, but without the same success. The director of the film is upset because now the car is damaged and they can’t film it without showing the damaged rear quarter. They rebuild the fence and Clarkson finally gets the shot right after three attempts. 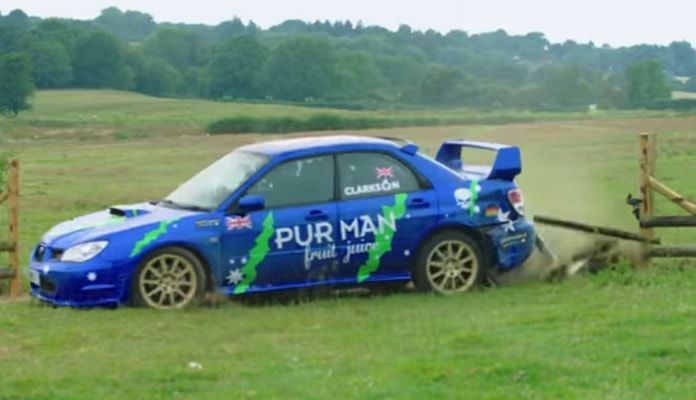 Later on, Clarkson hits a metal gate with the already-damaged WRX STI. What we aren’t sure if there were any sheep harmed in the filming of Farmkhana. Check out both videos below, and see how Clarkson does his best Ken Block Gymkhana impersonation. A Subaru WRX STI was harmed in the making of The Grand Tour: Farmkhana. Another reason not to watch the show. Ken Block is no longer with Subaru. Why didn't he pick another car? It's sad to see a good car be trashed like that just to prove he cannot drive like a professional driver.